My New Years resolution this year was to be organised and efficient. I planned a weekly on-line shop that would leave me free to blitz the house on a Monday morning top to bottom and then have you turn up at my door with the perfect amount of groceries for the coming week. Menu planning here we come. No more running out of nut-free-dairy-free-egg-free-taste-free school sandwich fillers. No more realising we are out of milk as the kettle is boiling for a much needed cuppa. Today you helped make that dream a little bit more of a reality and I feel the need to say a very genuine Thank-you. I checked the items off the list as I unpacked and it gave me an excited endorphine rush to see that you were generous in your portions. You gave me $20 of beef instead of the $15 I paid for and all the veggies and deli products were what I had requested and a little bit more. When you didn't have the 550gm box of Special K you sent two 300gm boxes instead at no extra cost. It doesn't take a lot to make me happy. I really should get out more. And the special offer on that yummy nut cluster, almond and coconut cereal... 99cents a box! Too good to be true I thought but put two in my basket. Yes, they were tiny trial sized boxes. I ate one for lunch. It was pretty good. And the free sandwich shape cutter you sent with my Bega cheese slices. You excelled yourselves! I had to make a sandwich to try it out. I ate my mummy cow and baby cow with a glass of milk and had memories of pre-school floating around my head. Then I snapped out of it and ate the discarded crusts like my mummy always told me because I want curly hair . I'm stuffed now and it's only 11am. I truly am a very happy customer. My fridge is overflowing, my belly full and because I ordered a large shop you didn't even charge me a delivery fee. If I could make just one last suggestion. Perhaps on your web-site you could introduce some recipe ideas for how-to-make-your-family-love-string-beans. Today was Rhiannons first day at High School. It went really well. Thanks to everyone for all your lovely messages of support and excitement. More photos and stories to come. For now bed is calling! We got a call this morning from the vet. 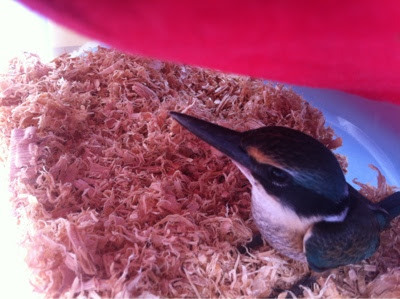 The baby kingfisher was in perfect health and had "found his wings!" Could we come in to collect him and let him free from our garden so that he would be back where he started? We had a very exciting drive home from the vet and held tight to the closed box. When we got out of the car the kids pulled back the tea towel and he flew from the box straight to the trees by the lake and sat on a telephone wire getting his bearings. "It makes you feel good inside"
Today when I got home from work there was a cry from the kids. A bird had hit the kitchen door and was lying stunned on the patio. It was a baby Kingfisher. We went outside and kept the chickens away from it while it sat huddled under the patio table. When it seemed unable to fly away we worried that its wing was damaged and put it in a box and drove to a local Vet. Rhiannon had some friends here this week and they spent a couple of hours making cards. The kitchen table disappeared under a mountain of paper, glue and scissors. I'm sure it would be cheaper and easier to buy cards in the local shops but they had fun and hopefully their family and friends will be delighted when they open one of these wonderful creations! I had the honour of being asked to be Godmother to a very special little girl this weekend. A very special little girl that I almost had the fun of delivering at home but who decided she would rather be born in the ambulance 2 minutes later! Instead of having the traditional Godmother and Godfather her parents decided to have two Godmothers. And so I found myself sharing the honour with another beautiful woman called Brigid. We have a lot in common. Both with Irish heritage, both a bit quirky and individual in the nicest possible way, and both sharing the privilege of overseeing the future of this perfect little girl. Buckle your seatbelt baby, It's going to be a fun ride! I love the iphone with its camera always at the ready to capture the ordinary and transform it into the extraordinary! I used the Instagram app to edit this photo while the kids enjoyed their treat from the local Gelato shop. I found myself with half an hour before I was due to pick the kids up so I made the most of it! We left home at 4pm leaving behind the kids with popcorn, movies, dinner cooked and babysitter to oversee everything. It was hot and sticky and I was glad of the hour in the car with air-con on full blast to stop my make-up running off my face. I painted my nails as Byron drove. Not the best idea when you consider the amount of roundabouts we stopped and started at! 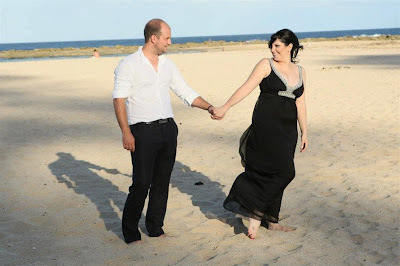 We pulled into the car park and circled for a space as families brushed the sand off kids and headed home for tea and other wedding guests jostled for their car spaces. Byron changed into his crisp ironed shirt in the car park and cringed as a couple strolled past us, the man wearing a full formal suit and tie (we had been told no tie needed!) The next couple to get out of their car were dressed similarly to us and Byron breathed out again. We weren't sure how many people we would know but as we walked into the surf club lots of the faces were familiar. The location was spectacular. The club was in an elevated position overlooking the sand and sea. We were handed welcome drinks, I could have downed the glass of cold champagne in seconds. The main conversation was excited whispers about the wedding itself. Everyone had a guess at what surprises lay in store. And then in walked the bride and groom. 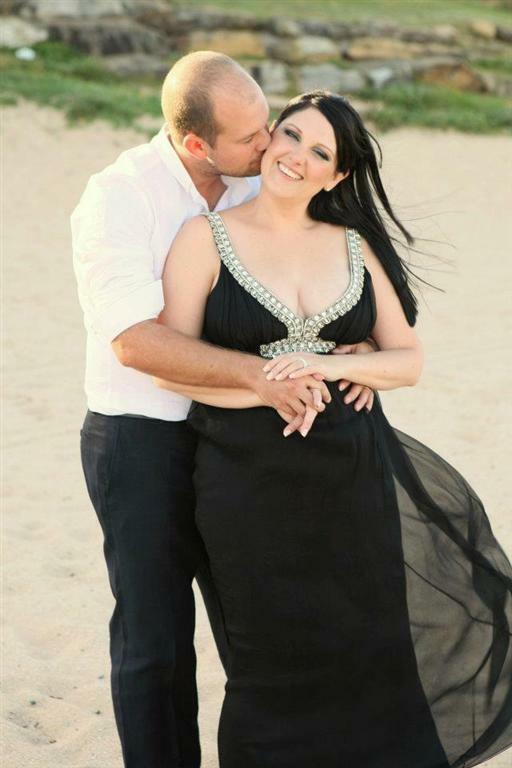 Tenelle had opted for a glamorous black and diamonte dress and Kane was wearing a cool linen shirt open at the neck. They both looked so relaxed and happy. After mingling with their friends and family they made their way down to the sand and exchanged vows and rings. Kane's Dad Mike took lots of photos and when Kane's Mum Lin posted them on Facebook I cheekily asked her if I could download them to use them here! When we all returned upstairs to the club the party really started. Cocktails were flowing. I liked the look of these pink ones with rose petals floating in them but boy were they strong! I moved on to these Mohitos with their refreshing mint sprigs. I tasted a friends Margarita and nearly died. It had trouble written all over it for someone who was planning on being up at 6am to go work in a hospital! Byron and myself kicked off our shoes as the sun began to set and went for a walk on the beach. It was so lovely to be strolling along a beach with the day sinking away at the horizon. Hearing the sound of laughter and music drifting in the evening breeze. It's not often we get the chance to have romantic time together. I think the romantic glowing feeling inside was probably helped along by the cocktails! Anyone could go in and have a series of 4 images taken which printed out onto 2 strips. One to put in a book for the couple and one to take home! I had so much fun going in with Byron and later with a bunch of girls. The more the cocktails flowed the more giggles came out of the booth. I'd love to have been a fly on the wall as the night wore on! The wedding cake was an ice-cream cake and a mountain of delicious Adriano Zumbo macaroons! The kids had watched Adriano on a recent tv series Junior Masterchef and I knew they would be so jealous that we managed to eat one of his famous concoctions. The brides Mum Anne read my mind and wrapped up one of each flavour to hide in my handbag and sneak home to the kids. We said our goodbyes at a respectable 10am as we had an hour drive home and I had an early start the following morning. I struggled to get out of bed when the alarm woke me at 6am. I left the "Zumbaroons" out on the table for the kids to find at breakfast before I slipped out the door to work...miraculously clear headed but still stifling a yawn or two! Thank you Tenelle and Kane for inviting us to share such a special day with you. You sure made your wedding memorable and very unique to you. I hope that you live the rest of your life with the same love and laughter and you always remember the special qualities that drew you together. We are off to our first Australian wedding. The Bride-to-be is not wanting too traditional a day so we are very excited to see what lies in store. 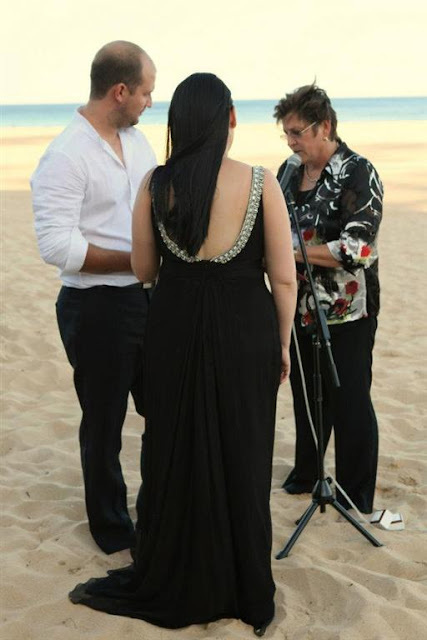 We know the ceremony will be on the beach (something I have always wanted to see!) That there will be cocktails afterwards and that it is a child free event. The kids are wishing they could come too. We have a babysitter organised and they will be left lots of treats to enjoy while we are gone but they are threatening to hide in the boot and sneak out and watch the ceremony from behind a sand dune! We will have to take lots of photos and tell them all about it the next morning. I've got butterflies in my tummy! I can't wait to come back and tell you all about it! Rhiannon has survived her first tornado! "Yesterday, about 3.40pm, with minimal warning there were raging winds, rain and hail (the grass turned white), no visibility across the lake, boats rocking wildly and branches flying, in one instance breaking a tile on our roof before crashing into our backyard. Our catamaran on the shore turned 90 degrees and was sitting on another catamaran. After the storm which some described as being like in a tornado, neighbours gathered to compare stories and wait for the LMCC crews to come and clear the blocked road. Two of the girls friends had been picked up from being at our house for the day and two were still with us. Their parents couldn't get down the street as branches were across the road. Then the task raking leaves, washing windows and picking up loads of branches began. Amazingly, the impact was mostly between Prospect Avenue and the fence outside our house at the end of the road. On the other side of the fence there were virtually no branches fallen!" The girls were very glad to see blue skies again and by the time I got there they were over their fear and posing on the fallen trees. I hope this experience doesn't add to Rhiannons already nervous disposition around wild weather! So far she is enjoying the re-telling of the "Adventure"
The button, the artist, the friend, the two girls, the other friend and the sister. Once upon a time in the beautiful country of Ireland lived a very talented artist called Jane. Jane loved buttons and made jewellery with them in her button studio in her hometown of Athlone. She loved her little creations and as time went by so did the people around her. The newspapers started to write about her and she was interviewed on the television and radio. Jane had a friend Nicola who lived nearby. Nicola was a generous spirited girl who loved nothing more than to spend time helping others. It just so happened that she spent time with the artist helping her prepare her wares for sale in a big craft fair in the city of Dublin. Nicola loved Jane's creations so much that she bought two of her necklaces and sent them across the seas to two girls who lived in Australia. The two girls were the daughters of Nicola's other friend, Gina. Nicola made sure that the two girls knew the story of the artist and how talented she was and how she hoped she would do well with her craft. The two girls loved their button necklaces because they knew they were unique and no one in Australia had anything similar. The friend Nicola travelled to Australia and visited the two girls and her other friend Gina. She talked about the time she had spent with the artist and Gina felt as though she knew her. Gina had a sister that lived in the city of Dublin back in country of Ireland. She had an important job planning a big craft fair. As she walked around the fair on the day it opened she felt proud of all that she could see. Talented people with all their creations selling to the people of Dublin. As the sister walked she stopped at one stall. It was filled with the most beautiful necklaces she had ever seen. Made from buttons no less. The sister stopped and wondered if perhaps her sister Gina who lived in Australia would like one for Christmas and so she chose one and wrapped it carefully and posted it to her. And so it was that on Christmas Day Gina unwrapped a beautiful necklace with the cutest buttons and laughed as she realised that her sister had unwittingly chosen a gift for her made by the artist that was helped by her friend. For anyone following the story of Kristian Anderson today has brought the very sad news of his death. 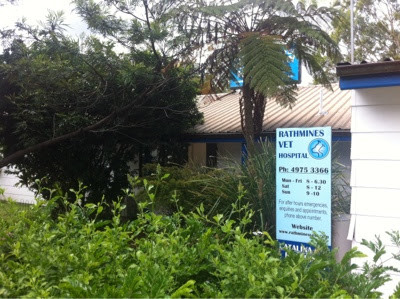 He died in a Sydney hospital this morning and his final blog was published by his wife Rachel this afternoon. 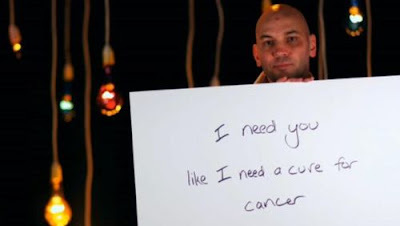 Kristian, I hope you are finally at peace after your fight against bowel cancer. Thank you for sharing the emotional journey with us. And to Rachel, as a mother and a wife my heart is torn for you today. I wish you strength and time to grieve and someday in the future a peaceful heart filled with memories of a man that loved you more than life itself.